Let’s discuss The Water Knife! Read through my discussion prompts below, then add your thoughts on those or anything else you felt was important to you. If you have written a review please include a link to it, and ask a question for me (or other book club buddies) to answer. And remember to check back to see if people have replied to your comments. **WARNING** The discussion prompts and comments below will contain spoilers for The Water Knife. Only continue if you have read the book! Who was your favourite character? And why? Did you have any predictions for alliances between the characters? And did they come to pass? Because of the style of the story with multiple perspectives on a collision course for one another it seemed inevitable that the characters would unite against a common enemy. However it didn’t quite turn out that way, as they regularly betrayed one another, right up until the very last page. Some of my favourite moments were when characters don’t take the opportunity to ‘buddy’ up with someone who isn’t suitable. In similar stories you would expect them to just buddy up, but I think Bacigalupi’s approach was more fitting for the personalities of his characters. What’s your vision of the apocalypse? The Water Knife is a particularly vivid and specific form of apocalypse, one where climate change results in mass drought. Do you think it’s a realistic vision? Though I enjoyed the novel, I think Bacigalupi’s vision, in The Wind Up Girl, of a post-peak-oil world dominated by corporations that control the world’s energy and food consumption is more realistic in its reflection of the complexity of the world. Do you think words have the power to shape what we think? There is a wonderful moment where Catherine Case talks about what she thinks formed part of the denial of the American population that the end of the world is upon them. And this has got me thinking about the power words have to shape our realities, and to give us the ‘old eyes’ Maria talked about throughout the novel. Look forward to hearing your thoughts and I hope you’ll join me in July as we read The Sudden Appearance of Hope! It took me a little while to get into this story, but once I did, I really enjoyed it. Thank you Tamsien for hosting this great book club, I may never have discovered this book otherwise. Each of the main characters added something very special to the story. I believe this book delivered a very important message about society and I’m going to [attempt to] explain it below through the characters involved. Angel, a gun for hire, doing the most horrific of deeds all at the command of someone else. He has accepted the way of the world, whether he agrees with it or not. Angel is representative of people in society that accept the system cannot be beaten, and so choose to work for it (or abide by its rules), in order to secure their own survival or for a peaceful life. For reasons unknown to others, whether it’s personal experiences, fear, etc, they are able to ignore, or have been conditioned to ignore, the suffering of others. My favourite character, Lucy, the journalist that could leave anytime she wanted but chose to stay and ended up going native. I think whenever someone is reporting a sensitive subject where many lives are lost, there is always the chance this may happen. Lucy is representative of those people in society, who see the pain and suffering of others and want to do something to make a difference. And lastly Maria, maybe the most important of all the characters. When she shot Lucy at the end, (I did not see that coming), was the perfect example of how far a person will go to escape. Maria represents those who have suffered to the point of desperation and believe any life is better than their current one, and will do whatever is necessary for the chance at a better life. While this a fictional story, and the characters are an exaggeration of what I believe they represent and I am no way placing anyone in any category, I think this story delivered an important message about human behaviour and raises some social and moral issues using the idea of water rights. My only dislike was the graphic detailed, and what I felt was prolonged, descriptions of the torture. The author could have conveyed how brutal the torture was to Jamie without giving us a point by point breakdown. Overall, I think this book is very cleverly written and once your past the first 30%, it’s thrilling and gripping. I will be joining you for The Sudden Appearance of Hope, a book so outside my reading comfort zone, I hope my local library has a copy! Thank you so much for sharing your thoughts Janel! I love how deeply you have thought about the different characters and what they represent. It’s such an interesting perspective and I definitely agree with you. I think we could add Catherine Case to the list, I think she represents selfishness and ambition. She is brilliant in her own way, but cares nothing for those who suffer as a consequence of her decisions. She also represents the American idol of the ‘self made’ character, working her way to a position of power, and yet lacking in empathy for the world that she has left behind. I look forward to hearing your thoughts if your library has The Sudden Appearance of Hope, it will definitely be a change of pace!! I think Pablo sets out to really shock us with the details because with the loss of society and law, humans turn savage. We see it with riots/vandalism. Living in the UK for the short while I did, seeing men going absolutely savage over a football match – its a scary thing. So I don’t think it was written in on a whim, but served the purpose to highlight humanities lack of value upon a life. Hi Tamsien, Thanks again for another great book selection and hosting the read-a-long. I honestly had not heard of this book before seeing you suggest it, and I am really glad you did. There is something incredibly powerful about the idea of a Dystopian society – perhaps it’s our need to feel (despite the woes of the world) we haven’t yet sunk to such a terrible level, or perhaps it is like watching a train wreck in slow motion and we cannot look away. We can see the depravities of the world and where a continuation of a certain path will lead us, but there isn’t enough change in the world to stop it? And there is always a political motive in dystopian stories, a party present who always has a need to control everything and everyone. Which I think Pablo hints at many times throughout the book with so many references to people owning “Cadillac Desert”. She is a product of her surroundings, becoming a part of Phoenix. She has the means to leave but doesn’t. It is like she is trying to prove she is a survivor by sticking it out in the worst environment. I do like the scene set in chapter 19 of Lucy being escorted out of Taiyang. She shows tenacity and a real sense of being able to do the job she sets out to do. I honestly had the usual preemptive nature when it came to reading the “buddy up” cliche that follows a dystopian story, but found it refreshing with Angel and Julio’s “don’t care” attitude. Although Angel does slip away from this with Lucy. It is a nice change from the usual “strength in numbers” precedent that tends to be found in this genre. This also reiterates the ‘lone wolf’ character of Angel and about only trusting and looking out for #1. The ending, I think, successfully blurs the relationship of right and wrong – especially in a society where desperation rules as strongly as money. The interesting irony of Lucy stealing the water rights to ‘save Phoenix and its people’ and Maria’s actions to stop Lucy, so she doesn’t have to return to Phoenix was a fabulous climax for me. Bacigalupi captured societies need to capitalise and control the fundamentals of life – water is the difference between life and death – and the story shows that money has become more important than life. This is especially highlighted in the “body lottery” and the attitude around “Phoenix Swimmers”. They are all inconsequential until its a high-society body showing up dead. Words are powerful. The pen is mightier than the sword etc etc. You see the subjects have a moment of realisation that the term they had demonstrated, showed their belief and societies instinct to portray “being a girl” as a negative thing. Words – and our understanding of words – especially in terms of ‘Slang’ and euphemisms are detrimental to building our attitudes of ourselves and the world around us. And I think this is especially strong in our societies marketing and advertising of the products we use everyday. Its a strong tool of propaganda right in front of us and we choose to not see it. So yes, I believe that words and the imagery that are attached to words have an incredible power to shape us. Hi Faye, thank you so much for sharing your thoughts in so much detail, you’ve really added to my interpretation of the book! This is why I love reading with others, everyone has such wonderful perspectives that enrich the text. You said that “it is like watching a train wreck in slow motion and we cannot look away” and I have been reflecting on that more and more over the last couple of days, as we continue to wait on a result from this seemingly never-ending election saga. At what point are we going to collectively stand up for the things that we can see, the ways we know we are destroying or poisoning our world? Will we ever? And what responsibility do we have as individuals? 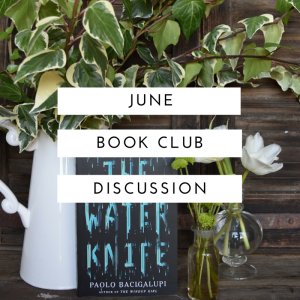 I don’t know the answer, but I think there is something to be said for the notion that Paolo expresses in The Water Knife that Americans have ‘forgotten what it’s like to have neighbours’ and I think that here in Australia we are much the same. We have lost sight of the value to be had in collective good rather than selfish attainment, and our world suffers for it. Ah, when you put it like that it makes perfect sense as to why he detailed the torture in that way, it served a purpose. Thank you for replying, as now I see the importance of that part of the story. The more I reflect on this book, the cleverer I think the author is! I live in the UK so I witness the football hooliganism far too often and the occasion riot we’re also prone to. This is a near-future thriller but it’s scary how much it applies to the present day. I enjoyed reading your review and I hope to join you both at the end of the month for TSAOH. I miss the UK so much – especially riding the tube and near everyone has a book/newspaper or some form of reading material! Its so lost here in Australia! I took my daughter to our local library today – but being in a relatively elderly community we are left with “Danielle Steel” and “Mills and Boon” Romance categories overflowing and everything else quite sparse. So I am hoping to my hubby let me gets TSAOH (despite me being on a no-spend July).